First up at the left is TKM@freedom, a fashion designer whose outfit consists of a black vintage Rick Owens asymmetrical leather vest, layered over a black hoodie sweatshirt with cut-off sleeves and safety pin embellishments from Rowan, and a loose knit distressed sweater. 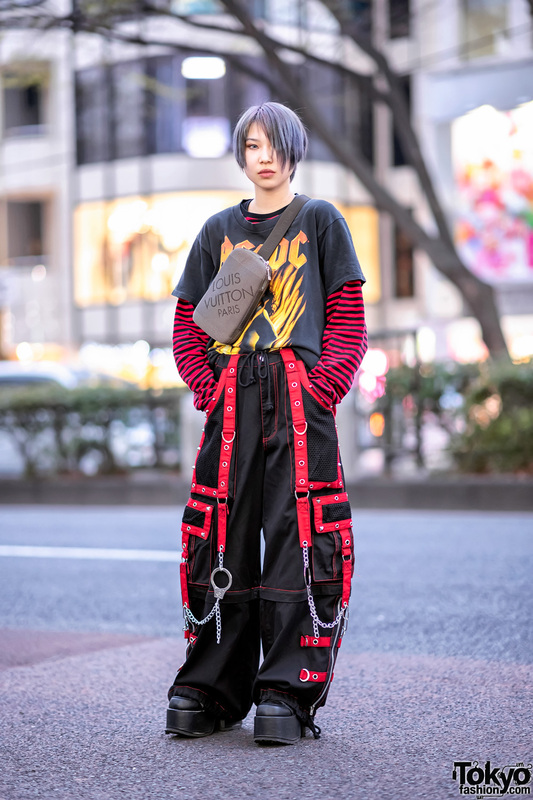 He paired his layered tops with red plaid pants, worn over a black pleated skirt from Hikari Onozaki. 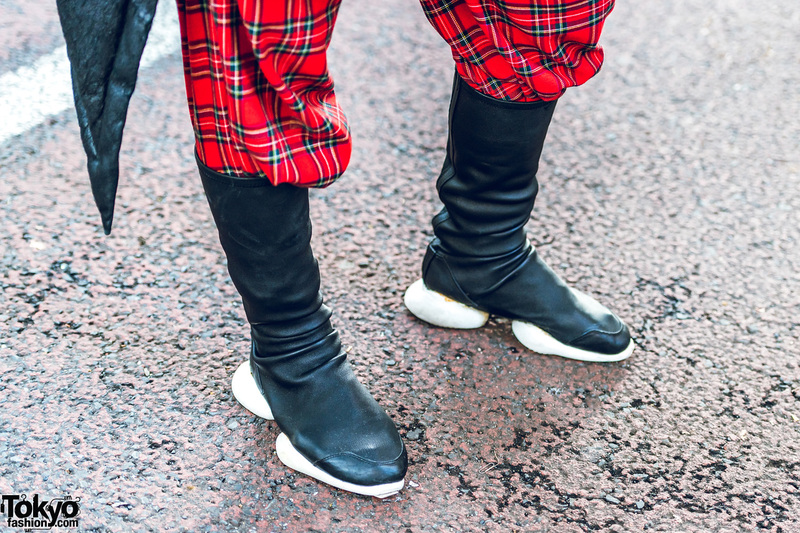 He tucked his plaid pants into a pair of black knee-high sock trainers from Rick Owens, and accessorized his look with items from his own brand, TKM@freedom. 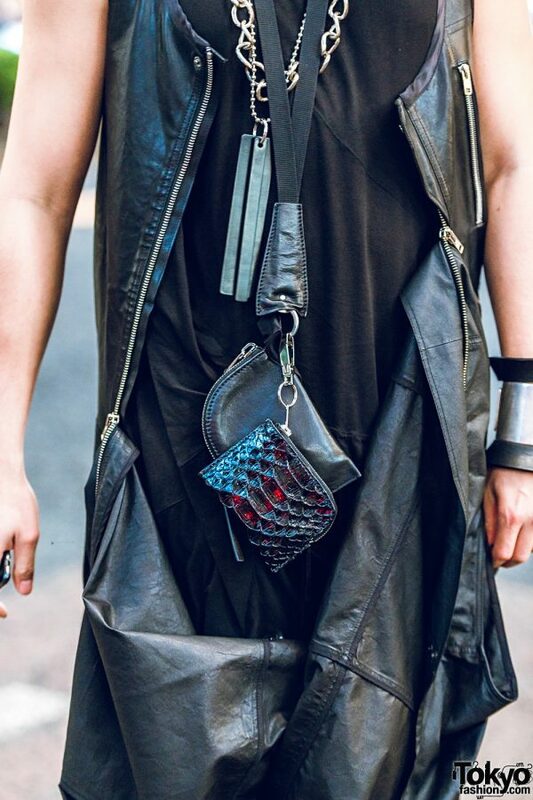 Accessories include statement coin sunglasses with a chained snakeskin face mask, a black beaded bib necklace, and silver chain accessories. Follow TKM and his style feed on Instagram. 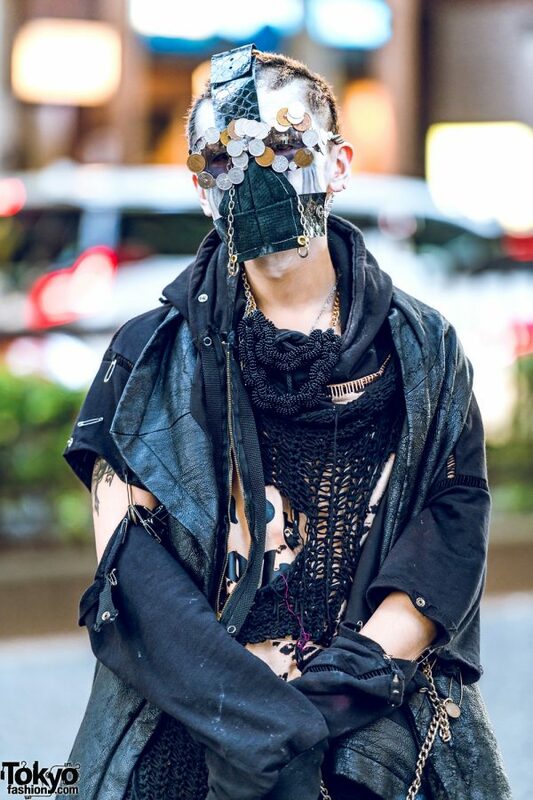 Sporting spiky hair with a black mouth mask is Kanji, an 18-year-old student. 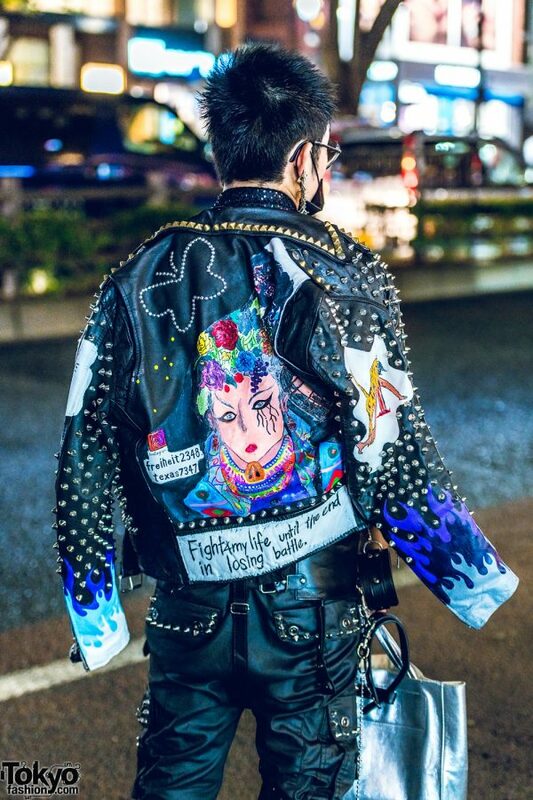 Kanji stepped out in a studded black leather jacket with blue sleeve flames and prints from Dog Harajuku, worn over a vintage black graphic print shirt and a black shirred vest. 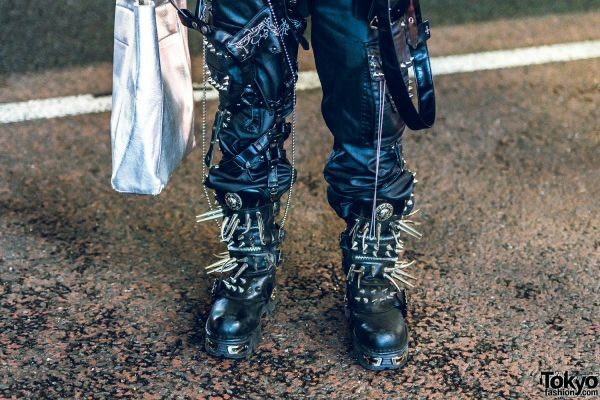 He donned black studded and strapped pants from Dog Harajuku, slipped into studded and spiked leather boots from New Rock, and carried a vintage silver tote bag. 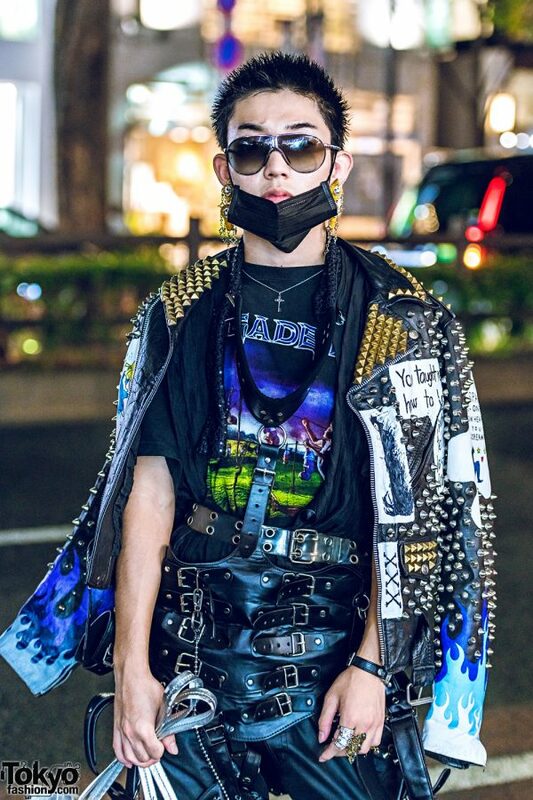 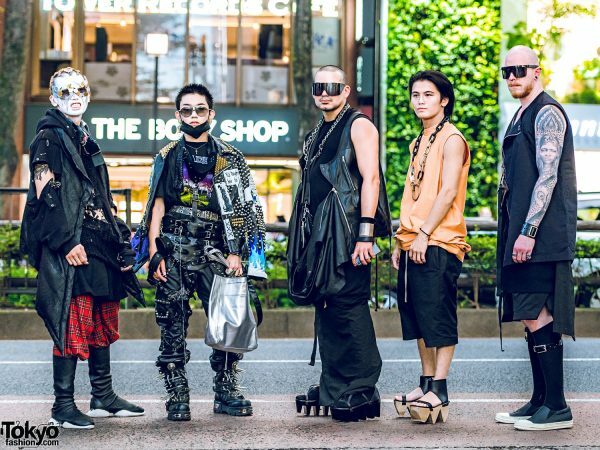 His accessories – mostly from Dog Harajuku – include sunglasses, gold drop earrings, a silver pendant necklace, a black leather grommet belt, a black leather full body harness, a black leather cuff bracelet, and multiple armor rings. Iris Van Herpen is Kanji’s fashion favorite, and he is also active on Twitter and Instagram. 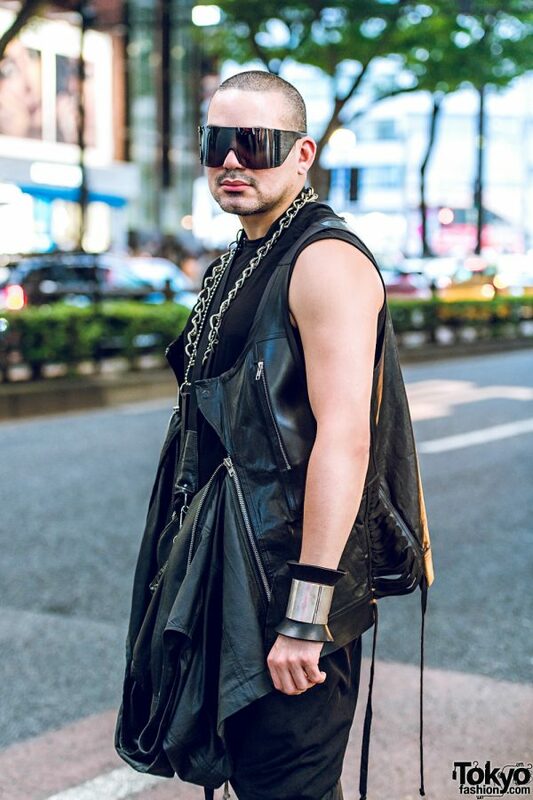 At the middle dressed in an all black look is Lima, a fashion stylist. 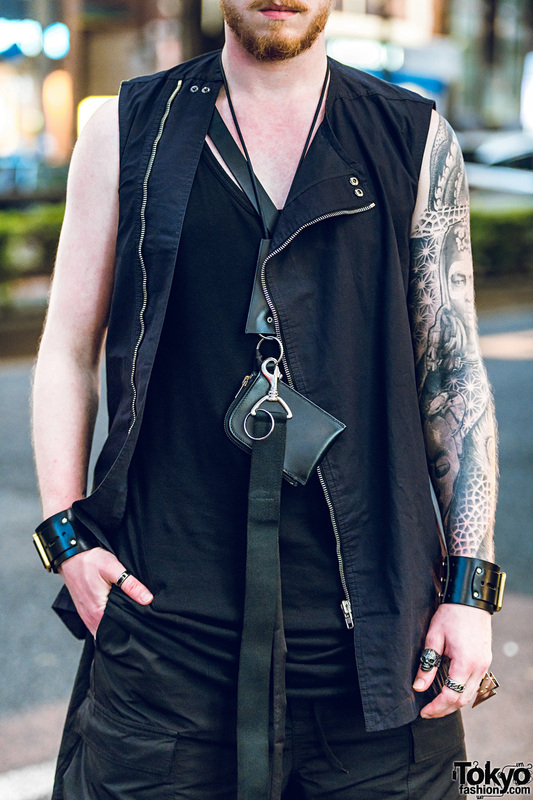 His outfit – all sourced from Rick Owens – consists of a black long tank top, worn underneath a black leather vest with extra asymmetrical panels, and black pants. 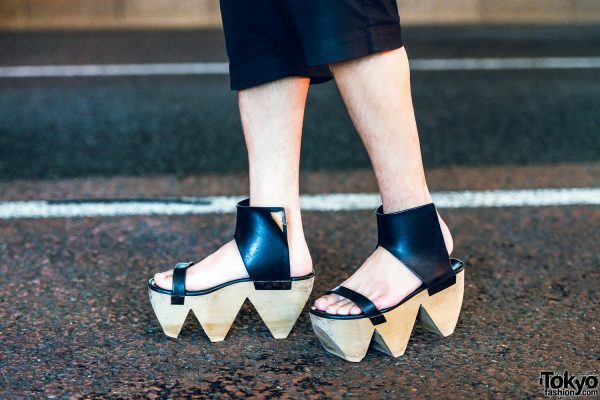 Black socks, black platform cut-out shoes with architectural heels, and accessories such as black wraparound sunglasses, a chunky chain necklace, neck wallets, and a geometric metal and leather arm cuff. 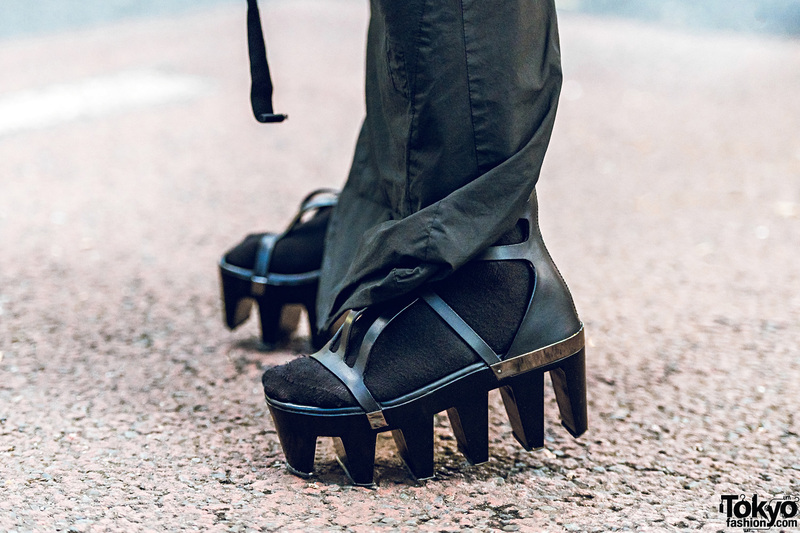 Follow Lima on Instagram. 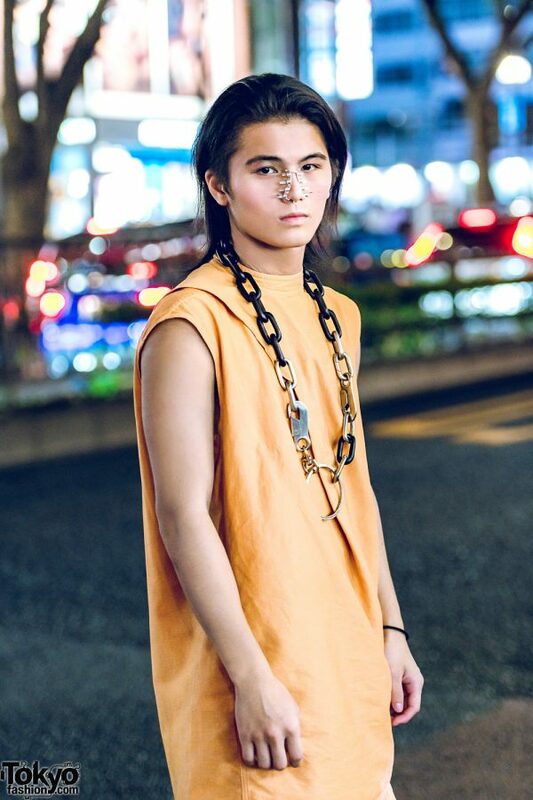 Sporting a black and orange ensemble is Towa, who is clad in an orange tunic top from Rick Owens, paired with black tailored drawstring shorts. 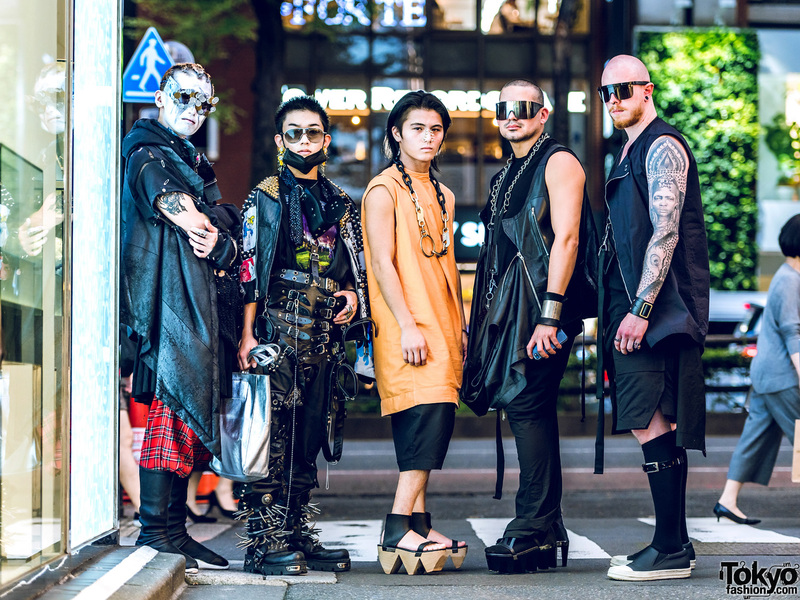 They styled their minimalist outfit with black ankle-wrap sandals with wooden architectural heels, and embellished their look with a statement-making nose spike jewelry from House of Malakai, and a chunky O-ring chain necklace from Parts of Four. 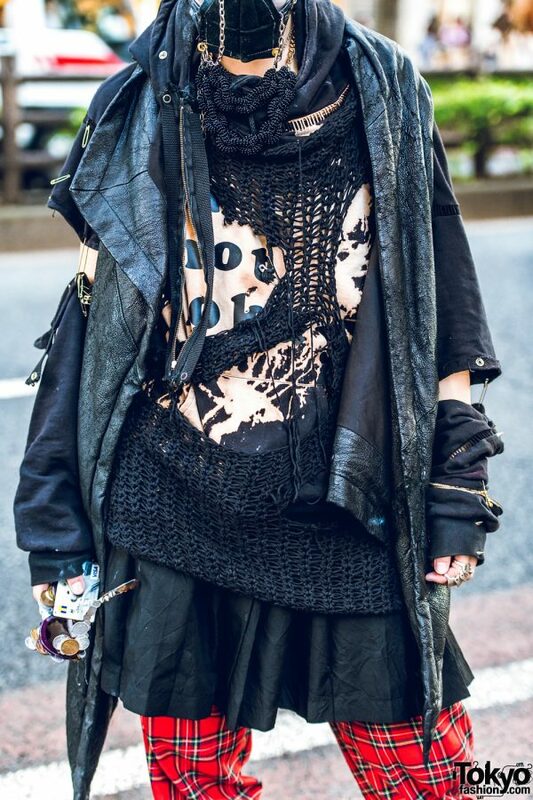 Check out Towa on Instagram. 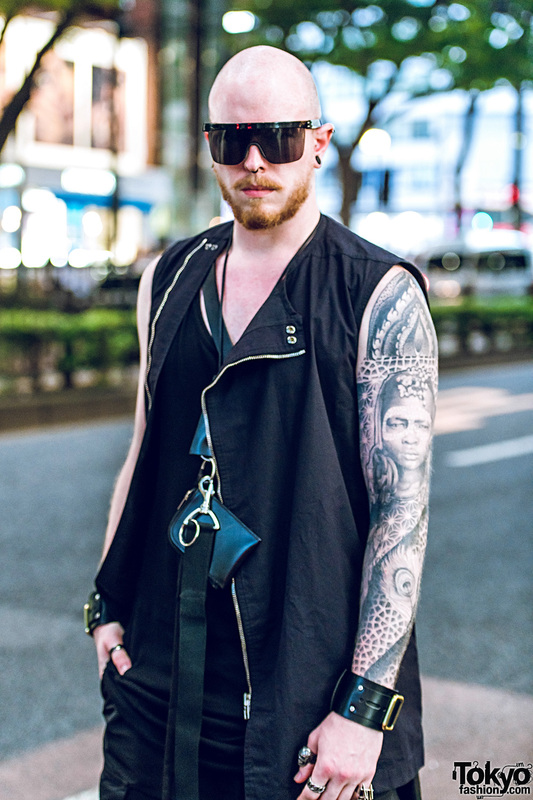 Meanwhile, Oliver – a Swiss musician – is also clad in an all black Rick Owens ensemble, which features an asymmetrical zipper vest with an extra panel, black tank top, and black tailored shorts. 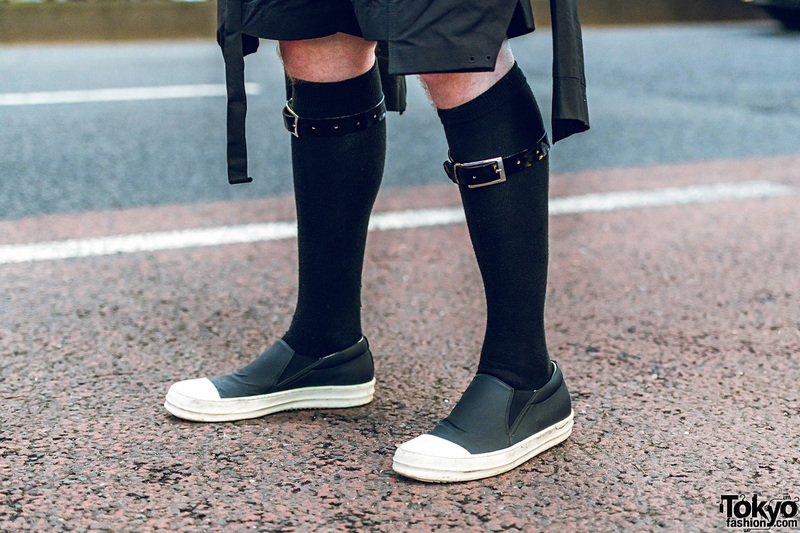 Black belted knee socks, black and white slip ons, and accessories such as sunglasses, black earrings, a neck wallet, leather cuff bracelets and multiple silver knuckle rings rounded out his style. Oliver is also active on Instagram, follow him!